A small club doing great things! Over the past 10 years, the members of the Rotary Club of Stratford have raised over $75,000 through their annual road race to support the Mikinduri Children of Hope. The club has also initiated their Rotary book sale in which 50% of the profits go to support literacy projects in the community. They are currently in the middle of their newest fund raising project which is to offer free maps of Stratford to every household. The sale of advertising not only pays for the maps but will generate profits for club projects. Community partnerships are an important part of the Rotary Club of Wolfville’s activities. Their contributions to the Sunken Lake Scout Camp have ensured that valuable programs for the youth of the area are undertaken. This year, they have taken the initiative to inspire Rotarians, not only in their club but throughout the District, to donate blood. The club annually sponsors the Rupert McNeil book prize to a deserving student. The club also knows the value of thanking their fellow partners and did just that by recognizing the Eastern Valley Hydro staff of Nova Scotia Power with a Certificate of Appreciation. What could be better in a valley known for the production of fruit and vegetables than to work with an organization that shares unused produce with those in need! 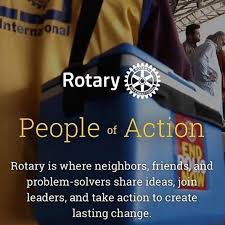 The Rotary Club of New Minas does just that. As part of their fundraising, they sponsor the Valley Harvest Marathon as well as a rather unique duck race. Their work to develop a small but beautiful local park along the main thoroughfare is a wonderful addition to the community. The Rotary Club of Wolfville – Mud Creek values youth in the community through their sponsorship of the “Cooking Master Classes” for kids. Through their “Numbers for Life” initiative, they see the proceeds stay in the community either through the weekly winners or their contributions to local charities such as the Kingsport Community Association or the Uncommon Common Art program. Again, their recognition of the value of youth is seen through their participation in our District Youth Exchange Program. The community of Kentville has a wonderful library which has become a focal point for residents young and old. This multi-purpose building was made possible through the hard work and financial contributions of the Rotary Club of Kentville. The community also benefits through the club’s participation in the annual Apple Blossom Festival. Club members recently had a “hands on” opportunity to give back to the community through their baking of muffins and granola for the breakfast program at NKEC.